From offices located in Miami, the attorneys of St. Denis & Davey, P.A., provide legal advice and representation for clients who have suffered financial damages as a result of their attorneys' negligence or misconduct in communities along South Florida's Atlantic Coast. The lawyers of St. Denis & Davey, P.A., are recognized for their dedication to holding lawyers and law firms to the highest professional standards. Common examples of legal malpractice include missing filing deadlines, breach of fiduciary duty, conflict of interest, improper documentation and failure to appear at hearings. In order for a case to ascend to the level of financial damages, you will typically be required to demonstrate that the lawsuit was lost or financial damages were reduced or denied due directly to the malfeasance. Attorneys at the firm have earned the highest AV preeminent peer review rating* for high ethical standards and legal ability. Co-founder Donald St. Denis is certified by the Florida Board of Legal Specialization as a certified civil trial specialist. A statute of limitation is a law that provides for a time period that, once past, forever bars you from pursuing a particular legal claim. In the world of legal malpractice, breach of fiduciary duty occurs when a lawyer puts someone else's interests above a client's interests in a legal matter. Examples of conflicts of interest include violations of confidential information, breaches of duty of loyalty, misconduct, oversight and misrepresentation. 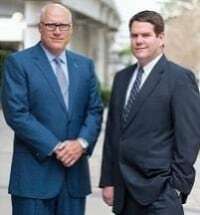 Seeking compensation for your Florida attorney's legal trial errors, or failures during your trial, is what we do at the North and South Florida legal malpractice law firm of St. Denis & Davey. When your attorney's carelessness, negligence or inattention threatens your finances or freedoms, we can help.